We knew RVA MakerFest was going to be great, but the enthusiasm the day of the event was even more than we dared to imagine! The energy and excitement of both makers and visitors for everything they were seeing and learning and doing was infectious. Our booth was out back on the traintracks in the picturesque former train station that currently serves as the Science Museum of Virginia. The crowds started bright and early on a golden, perfect end-of-summer day, and didn't let up until early evening. Our biggest, most spacious booth ever. Doesn't the column add an elegant touch? Kyle and friends, plus the gang from the Central Virginia Blacksmith Guild, spent the day demonstrating at the anvil. For the mosaic demonstration, we invited the crowd to help us out with a group project featuring the Richmond "RVA" symbol and an outline of Virginia. We created this piece from 100% reclaimed material! 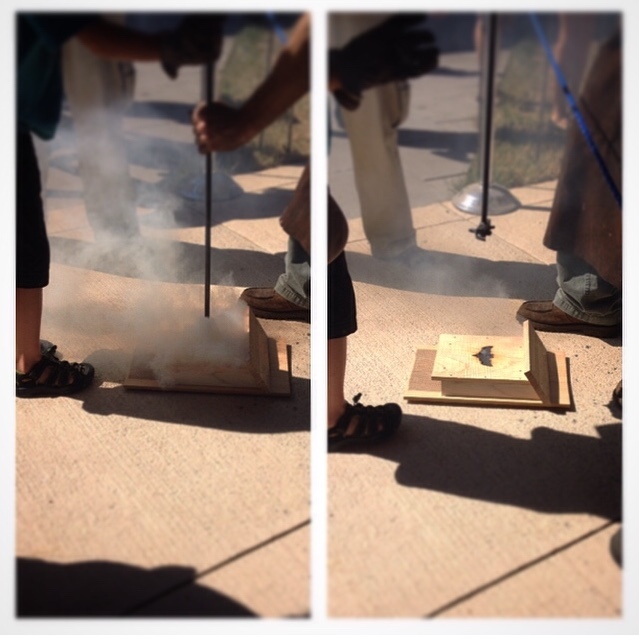 Branding bat boxes and bird houses offered a more hands-on blacksmithing project. After building a house with Clawhammer Company in a nearby booth, makers stopped at the forge for the brand of their choice. Thanks to a crowd of over 4000, the RVA mosaic was completely filled in by the end of the day! Stay tuned for photos of the finished piece grouted and installed in a frame. Who should be the recipient of this truly crowd-sourced piece of RVA love? ?